For the BBC News television series, see Reporters (TV programme). This Week is a British current affairs and politics TV programme, screened on Thursday evenings on BBC One. It is hosted by former Sunday Times editor Andrew Neil, with a panel of two commentators, one each from the right and left of the political spectrum. The show was introduced on 16 January 2003, along with The Daily Politics, after a major review of BBC political programmes. It replaced the nightly Despatch Box (1998–2002), for which Andrew Neil had been the sole presenter in its later years, and which, in turn, had been a replacement for The Midnight Hour (1994–1998). Following Neil's decision to stop being the presenter from July 2019, the BBC decided to not continue with This Week. With a more light-hearted tone than most political programming, This Week prides itself on being "punchy, irreverent, satirical". It is also committed to being one of the only current affairs shows on television with an absence of "party spin" from its regular guests, despite their party affiliations. 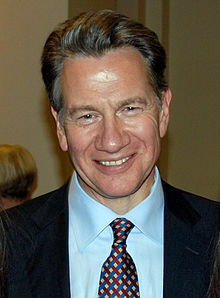 This was aided in the show's early years by the fact that Michael Portillo, the regular Conservative commentator on the show, left the House of Commons in 2005, while the Labour Party commentator until 2010 was Diane Abbott, for many years a backbench Labour MP noted for rebelling against her own party. The two were thereafter ostensibly an "odd couple" coming from different sides of the political spectrum (albeit with a long-standing friendship dating back to when both attended grammar school in Harrow, even having appeared in a production of Macbeth together). During her unsuccessful campaign in 2010 to lead the Labour Party and her subsequent tenure as Shadow Minister for Public Health, Abbott began making only occasional appearances, her ability to speak without constraint becoming noticeable. Eventually, her place was taken by another Labour MP, in rotation each week, always a backbencher, most often Alan Johnson. After returning to the backbenches in 2013, Abbott appeared on a fortnightly basis, alternating with Johnson. Since her appointment as Shadow Secretary of State for International Development in September 2015, she has rarely appeared, and the tradition of Labour MPs alternating in the spot has continued. Since 2013, Neil's golden retriever Miss Molly has also frequently appeared on the show, often walking in front of the camera during shots or choosing to sleep next to guests. Miss Molly's first appearance was coupled with an increase in This Week's ratings. Shown directly following Question Time, This Week presents itself as a more laid-back companion to its predecessor, with episodes regularly opening with a summary of the week's main events in the form of a parody of a popular television series. At the beginning of each episode, Neil asks the two regular commentators for their "Moment of the Week", occasionally contributing his own "moment". The standard format consists of three segments, with a guest contributor featuring in each. The first features a journalist or commentator who presents their "Take of the Week" in a short film before appearing in the studio to discuss their perspective further. The second segment is a light-hearted "Round-up of the Week" in and around Parliament, formerly presented by Mark Mardell, who left the show on becoming the BBC's Europe Editor in 2005. Currently, the "Round-up" segment is presented by a rotation of writers and broadcasters. This is followed by a discussion between the hosts (often joined for this segment by Miranda Green) of the issues raised. The third main segment, "Spotlight", typically focuses more on cultural topics and features a final guest. For many years, there was often also a quiz at the end of the show, in which Neil took pleasure in demonstrating the commentators' ignorance of a range of topics, though this feature no longer appears. Though primarily a political discussion programme, This Week has achieved notoriety for its humorous approach to current affairs. For example, during the 2005 General Election, the show's title sequence spoofed the recently re-released version of "Is This the Way to Amarillo" and its video featuring comedian Peter Kay. In 2011, following the announcement that the techno band Underworld were to perform at the opening ceremony for the London Summer Olympics, the show's ending credits featured Neil and his guests raving to the band's music. The clip subsequently went viral on YouTube, helping to increase the show's unconventional popularity amongst younger audiences. In 2006, the programme won the Hansard Society Award for Opening Up Politics which was awarded at the Channel 4 Political Awards ceremony. During the general election campaign of 2010, This Week was broadcast on Monday nights in addition to its usual Thursday night slot, with contributors including Sarah Teather, Lynne Featherstone, Caroline Flint and James Purnell and the late Charles Kennedy. In keeping with its comic style, This Week has several recurring jokes and nicknames. These include assertions that the show's viewers watch the show drinking Blue Nun, David Cameron watches the show in bed wearing his pyjamas, that the cast regularly go to a nightclub after filming is completed—Annabel's in Berkeley Square or Lou Lou's in Mayfair—with Charles Clarke providing the guests a minicab service even when he is not appearing on the show. It is also frequently sarcastically said that the show has a budget of almost zero, and has few or no regular viewers. While giving out the Twitter and Facebook handles for the show (in the process, creatively mangling the names of the social media sites), Neil also insists that no comments posted by viewers will be read. Also, every episode begins with the words "Evenin' all" and ends with "That's your lot for this week". The middle section is introduced with "Now, it's late; [topical event]-late." Following Diane Abbott's departure from the show, Neil would joke that her leadership bid and later appointment as Shadow Minister for Public Health were part of her "insatiable lust for power". On the rare occasions now that she makes an appearance on the show, Neil introduces her by saying "And back by absolutely no public demand whatsoever...". In weeks where the Speaker of the House of Commons, John Bercow (or his spouse), has featured in the news, the end credits are frequently shown over a scene of the diminutive Speaker being ceremonially escorted into the House of Commons to the music and lyrics of Jimmy Dean's "Big Bad John". "Our Dear Leader" - BBC Directors-General Lord Hall of Birkenhead 2013–present; Mark Thompson until 2012. During general elections, the show starts with the 'election song'. The 2005 election song was "Is this the way to Election Day?" (a spoof of "Is This the Way to Amarillo?" by Neil Sedaka and Howard Greenfield), and for the 2010 election the song was "We're Off to Find a PM" (a spoof of "We're Off to See the Wizard" by Harold Arlen). ^ "BBC News - This Week theme music". BBC News. 20 November 2009. Retrieved 5 June 2010. ^ a b Glennie, Alasdair (29 March 2013). "Miss Molly, the new golden girl of politics: Andrew Neil's retriever given free rein in BBC's This Week studio... and even dozes off on David Starkey's lap". Mail Online. Daily Mail. Retrieved 8 July 2016. ^ Cozens, Claire; Deans, Jason (20 September 2002). "The BBC: A new manifesto for viewers". The Guardian. London. ^ Moore, Matthew (14 February 2019). "BBC to axe This Week as Andrew Neil steps down". The Times. Retrieved 15 February 2019. ^ "About This Week". BBC News. 4 September 2008. ^ "Andrew Neil". BBC News. 5 September 2008. ^ "This Week - About This Week - BBC One". BBC. Retrieved 7 July 2016. ^ "Andrew Neil raps for Tinchy Stryder in This Week's quiz". BBC News. Retrieved 8 July 2016. ^ "Amarillo becomes election soundtrack". BBC. 12 April 2005. Retrieved 8 July 2016. ^ "Underworld rave tribute credits from This Week panel". BBC News. Retrieved 8 July 2016. ^ "Opening Up Politics". BBC News. 11 April 2006.